Foreigners, especially those from Anglo-Saxon countries, are often taken aback by our “kanapki”. These open sandwiches we eat at every possible mealtime leave the “filling on top” exposed to the elements, unlike in so-called “normal” sandwiches. Whether highbrow or everyday, Polish sandwich cuisine draws from a long tradition that may just surprise you. Kanapki (from the French word "canapés") appeared in Poland at the end of the 19th century thanks to French cuisine. Smaller open sandwiches, or canapés, were actually called “tartinki”. The names have a certain irony here though, as “tartines” in France are actually large open sandwiches, while, as everybody knows, canapés are bite-sized. Though initially must-haves at the exclusive parties of the rich, tartinki were later democratised, and during the communist period they were a crucial ingredient in the everyday diet of the average Pole. Big Anglo-Saxon style sandwiches only became trendy in Poland comparatively recently. At the turn of the 20th century, hundreds if not thousands of these canapés were served at balls and parties. During a ball in 1905 organised by the governor of Galicia, Count Potocki of Krzeszowice, his 1,300 guests were presented with 2,000 canapés of various types. Some theorise that the canapé, because of its friendly one-bite size, even contributed to the transformation of parties from seated affairs into standing ones. Today they are associated with preparing meals in a hurry, but canapés used to demand cooking skills. The uncrowned queen of 19th-century Polish cuisine, Lucyna Ćwierciakiewiczowa, emphasised that preparing canapés was not an easy thing, because to serve them properly, you needed specific knowledge of many things and the ability to apply it. A particular canapé savoir-faire reigned in other culinary spheres too and continued even up until the post-war period. Canapés were made with slightly stale white bread, because fresh bread was hard to slice and would crumble. Cooks would cut mini slices and lop off the crust. Often, they would fry one side. Onto this cooled and crunchy bread, they would add flavoursome ingredients. Butter was a necessity and was to be fresh, not too hard, and quick and easy to spread. Although Poles still like flavoured butter today (such as garlic or herbs, while restaurant chefs often experiment with smoked or mushroom butters), before 1939 the most popular were flavoured with anchovy and crayfish, both of which are rare nowadays due to the lack of easy access to the ingredients. Equally important when making canapés were good quality products used to decorate the top. They had to be fresh, delicate, tasty and very thin-sliced. To improve the overall effect, cooks used time-consuming tricks. For example, hard-boiled eggs were separated into yolk and white then each put through a strainer. Canapés would be garnished with gourmet hare, game, foie gras or galantine. After putting a slice of roasted meat onto a tartinka, it was brushed with a thin layer of aspic or bryndza (a Carpathian sheep cheese), mixed with butter and cream. When it came to cold cuts, the most popular were ham and ox tongue. 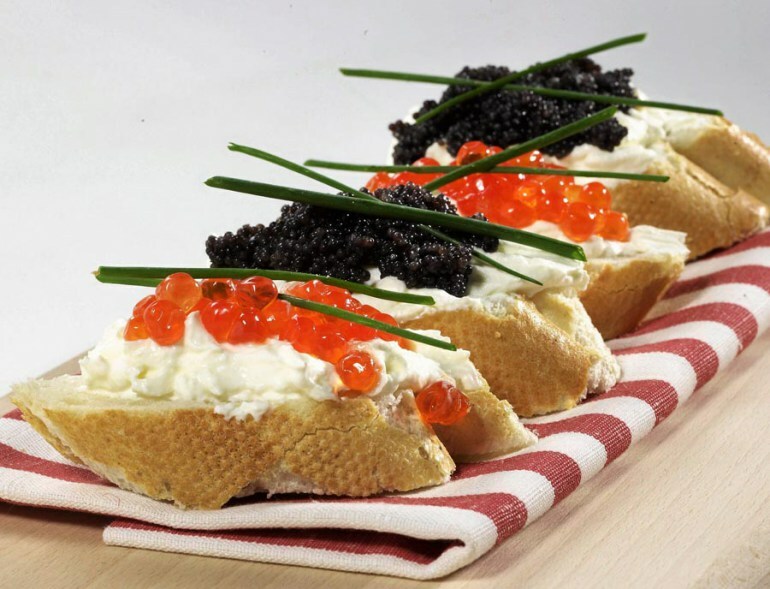 Common additions were also caviar, salmon and anchovy – but never sardines as they were considered “too thick and covered with inedible skin, and when laid on a bread roll, they look clumsily and coarse.” Demanding gourmets could also try canapés with crayfish or lobster, though they did not scorn simpler toppings such as Swiss cheese, herring or even bryndza. Despite what you might think, people actively avoided stuffing themselves. Though the rules stayed the same, from the interwar period onward canapé preparation was treated less restrictively – for example, sardines started appearing on them. Canapés still remained an appetizer before lunch, breakfast and dinner, and not a dish as such. They were served on a tray, placed on a white doily sprinkled with garnish. If several kinds were prepared, they were arranged in rows or a chessboard pattern. Open sandwiches, apart from their ubiquity at parties, were introduced in restaurants. For many years, Kraków took pride in the legendary multi-layer sandwiches created by Antoni Hawełka. Made with fresh bread rolls lathered with cream butter, he covered them in layers of ingredients, including lobster and matured ham. When one of Hawełka's employees moved to Warsaw and opened a similar business, he immediately won the hearts and bellies of the choosy capital clientele. To understand the popularity of open sandwiches in those times, it’s worth shining a light on the story of another Kraków inhabitant at the turn of the 20th century: Franciszek Trześniewski. He moved to Vienna and remains commemorated in the city’s gastronomy as the founder of a popular bar serving sandwiches called "Trześniewski". After a hundred years the company is still doing very well, selling about four million canapés a year. They are small rectangular slices of rye bread with old-fashion spreads made of herring, bacon, crab, liver or even carrot with curd or tuna. 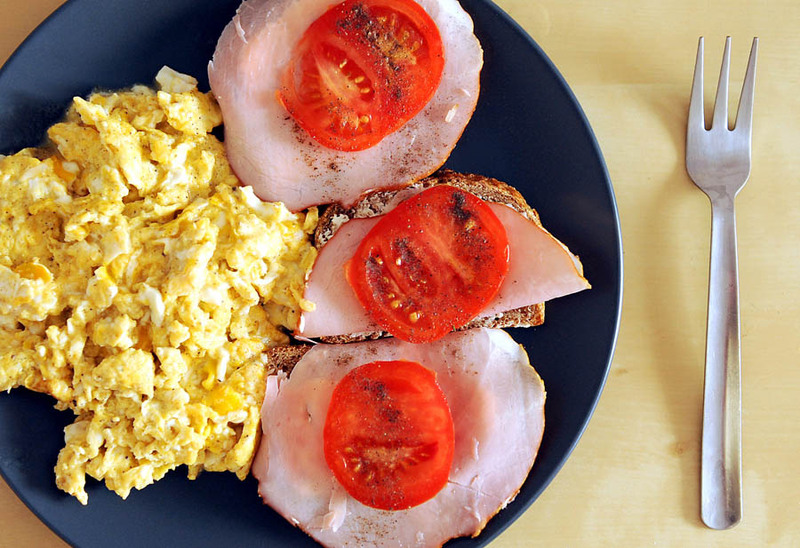 However, the most popular one is the simplest: egg. After 1945, the Polish word for canapé "tartinka" was replaced by the polonised “kanapka”. Its size increased and its role changed: it became a dish instead of an appetizer. It had evolved into the open sandwich. The slices of bread were bigger and the ingredients more simple, not to say poor. Although the cooking bible of the communist era, often called Kuchni Polskiej (“Polish Kitchen”) said the rules of preparing the more elegant tartinki served at parties had not changed, access to the ingredients certainly had. Galantines, lobster, crab and Swiss cheese disappeared. People were happy to just get hold of a bit of ham, fish or yellow cheese to put on their open sandwiches. Since they had to deal with ubiquitous shortages and replace ingredients with whatever was available, various types of pastes became common, such as egg, curd, and sprats in tomato sauce. They were served on long wheat rolls, pumpernickel or sifted flour bread, accompanied by hard-boiled eggs, horseradishes, tomato, pickled cucumber and lots of mayonnaise. There were even spreads made from processed cheese and margarine. Thanks to housewives' resourcefulness, these modest sandwiches were often served with homemade pickles that would add a clutch of flavours, such as pickled pears, plums in vinegar, or, most popular of all, marinated mushrooms. You can serve different kinds of canapés separately or arrange different kinds in rows. There should only be one layer of them, touching each other along the rows, and you must treat them carefully to avoid disturbing their decoration. You should also leave some space between each open sandwich so there is some space for additional decoration. Platters and trays should be decorated with salad leaves, stalks of parsley, tomatoes and radish. Despite ever changing culinary habits and the fashion for big nutritious satisfying sandwiches, the tradition of open sandwiches has been preserved by the city of Cieszyn. 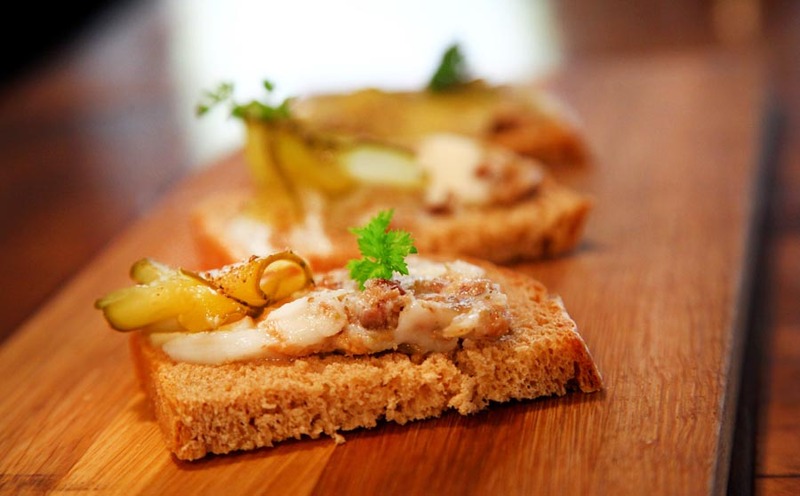 For several decades now, a crucial part of the city’s culinary landscape has been the open herring sandwich, and it even has its own festival. Available in almost every convenience store, it’s made up of a slice of bread, mayonnaise, herring, hard-boiled egg and chopped parsley. Although the ingredients are not very sophisticated, the taste is said to be difficult to replicate. So, do modern Poles prefer open or closed sandwiches? Today the Polish landscape for sandwiches has become confusing and needlessly varied, with globalisation introducing foreign sandwich styles upon Poland’s unsuspecting citizens. It’s hard for Poles to avoid those closed western-style floury baps when grabbing something to eat on their lunch break, the sort of doughy lump that makes them question whether they could possibly wolf down that much unnecessary bread. Is it any wonder that, even in Poland, gluten intolerance is reputedly on the rise? There is, of course, the mighty zapiekanka still representing the modern open sandwich. These half baguettes toasted with a range of toppings are, for all intents and purposes, the drunk person’s canapé… or perhaps just PRL pizza… Either way, the zapiekanka proves that whatever the occasion, Poland will always be ready to feast upon an open sandwich.